I grew up on a farm about five miles south of Merrill, Iowa. I met my husband Mark when I was living in the San Francisco Bay area. He is originally from Berkeley, California. We moved to Merrill in 1991 and have two children. Our daughter Casey is in her fourth year as an art teacher in the Mid-Prairie District (just outside Iowa City). Our son Sam just finished his last deployment in the U.S. Navy and will complete his service to the Navy in December 2017. He runs the nuclear reactor on a fast attack submarine, the U.S.S. Santa Fe, based in Pearl Harbor, Hawaii. One of my favorite hobbies is gardening, and I also enjoy doing arts and crafts projects. Both Mark and I enjoy cooking and entertaining. We appreciate many types of ethnic foods and delight in learning to prepare new dishes. I graduated from Le Mars Community High School and then attended Iowa State University; Laney College in Oakland, CA; San Francisco State University; and graduated from Oregon State University in Health and Human Sciences. I worked as a house painter and in interior design and publishing in California. Upon returning to Iowa I worked in the Student Services Office of Teikyo Westmar University. In 1994 I started working at the Siouxland Medical Education Foundation family medicine residency program as the Education Coordinator. The program is affiliated with the University of Iowa Carver College of Medicine and supported by the two Sioux City hospitals. I retired in June 2016. Since retiring I have become involved as a volunteer with the Mary J. Treglia Community House in Sioux City, which strives to serve the needs of the immigrant population in Siouxland through education, services, advocacy, and celebration of diversity. I’ve identified as a Democrat since I was first able to vote. I campaigned in most presidential elections, starting with Senator George McGovern’s run in the 1972 election. Since retiring I find that I have more time to be involved in political activities beyond presidential elections. I have earned the credential of Master Gardener through the Iowa State University Extension and Outreach Office, although I may never actually consider myself a master but rather an undefeated amateur! Also, I recently sought and obtained ordination after being asked by two friends to officiate at their wedding. I am most proud of my children, Casey and Sam. Both are bright, caring, respectful young people who are committed to using their time and talents to make the world a better place. Dr. Wangari Maathai, a 2004 Nobel Peace Prize winner, is a Kenyan who started the Green Belt Movement. Through her work as an environmentalist over 30 million trees were planted across Kenya. She also worked throughout her life against political oppression and suffered greatly for her views but persisted until her death. I have five kids and eight grandkids. I enjoy fishing, and when I find time to get away Victoria Nicolls and I like to travel. We go down to Texas in the winter to see my daughter and one of Victoria’s friends in Corpus Christi, TX. I was born in Sioux City, IA, and raised on a farm outside of Merrill. I attended school in Akron and graduated from Akron High School in 1977. I started a trucking business in the summer of 1977 and ran it until the spring of 1979, at which time I went to work for John Deere for the next 25 years, doing everything from shop work to parts, sales, and then service manager. I left John Deere in 2004 to start my own business and built a shop/home outside of Akron by C38. I have also farmed for many years. I did it on the side while working with John Deere and still farm today. I have three full-time employees and three part-time employees. We work on equipment/tractors, farm, and have a trucking line hauling grain. Victoria and I both got involved in the Plymouth County Democratic Party last year when we could see people were very confused about the Democratic party. I was privileged to be a delegate at the State Convention in Des Moines last year and I attended the National Convention last summer in Philadelphia, PA, as an alternate delegate. I ran for Iowa’s 5th District House of Representatives in 2016. I lost that election, but I plan on running again. I consider the first run a practice run. I was nominated at a nominating convention and really got a late start in the race. I participated in many parades and other public events and knocked on a large number of doors during the run-up to the election. I was recently elected Vice Chair of the Plymouth County Democrats. Ninety-nine percent of my family is Republican; they were registered Democrats and switched when the churches began to enforce it. I used to race cars and did tractor pulling. I won a lot of trophies at tractor pulls. I am really proud of how my kids turned out, and I have a bunch of very special grandkids. They’re all good workers and very respectful. I am very amazed with Warren Buffet, how he is so original, normal, and just a down-to-earth, simple guy. You’d never ever know he’s worth billions of dollars. I enjoy assisting people and their needs. I have recently become very educated in the political system. This winter Victoria and I took several trips out of state to show our support and help fellow party members at marches across America and plan to do more. After meeting Pat Ritz I moved to his house in Merrill, IA, for one year. After Pat built a house and shop on his land in Akron we moved to the farm and remain there today. I enjoy my four horses, two donkeys, four pups, and my kitties. I also enjoy roller skating and taking Pat’s grandchildren to the skating rink. I was born in Sioux City, IA. I attended Crescent Park Grade School then went to Hoover Junior High and then on to West High School. After graduating from West I left at 18 years of age and moved to Texas for 20 years before moving back to Sioux City in 2003. I worked for the Argosy Casino for two years. Now I help Pat Ritz on the farm and sell flowers as a small business. I have been a lifelong Democrat. I have gone to many marches and protests, including the inauguration protest in Kansas City on January 20 and the women’s march the next day; a march coinciding with the electoral college in Austin, Texas; at Steve King’s Sioux City office; and at Governor Branstad’s farewell dinner in Sioux City. I have also helped out in parades, at the booth during the Plymouth County Fair, decorated election headquarters, and knocked doors to get out the vote prior to the election. I attend most meetings of the County Central Committee. I’m a pretty good roller skater. I used to do it when I was a kid and it was like a second home for me. I’m proud of my evergreen trees I’ve planted on the property for windbreak. It looks really nice, and I’m proud of how it turned out. George Washington. He helped us win the revolutionary war and became the father of our country. He stood for what America was all about. How long have you been active in your favorite causes and/or community in Iowa? I’ve always been a strong-headed person for women’s rights but never really spoke up and said much. I just didn’t feel like I needed to. But after what happened this past election and the time since then, I felt like I should have done more and am becoming more active. Were there any significant hurdles or fears you had to face over the years? I’ve had issues with learning disabilities that have held me back. My wife Ardella and I met as students at Westmar College in Le Mars in 1951 and were married April 7, 1962. We have four great kids, Beth, David, Jill, and Doug; nine grandchildren; and 3 great-grandchildren. My hobbies include fishing, photography (college annual photographer at Westmar and post photographer at Fitzsimons Army Hospital), camping, cycling (a founding member of the Plymouth County Cyclists and frequent participant of RAGBRAI and other area rides), reading US history books and books about famous people, and actively volunteering with the Plymouth County Democrats. I spent the first nine years (primary through 8th grade) of schooling at Stanton #5 grade school located six miles south of Le Mars. I was one of the 18 or 20 students there. High school was in the Le Mars Community School, specializing in vocational agriculture. I received a BA degree from Westmar in 1955, earning a divisional major in the natural sciences. I farmed in partnership with my father, Robert Hodgson, for a couple of years, beginning in 1958. After a few years he and my mother Mary Hodgson retired to Le Mars. I farmed for a total of 17 years. Ardella and I became active volunteers in Berkley Bedell’s campaign for Iowa’s 6th Congressional District for US Congress in 1974. Upon his successful election the Congressman asked me if I would be willing to become a member of his staff as farm advisor. After a great deal of thought and family discussion I accepted his offer and was a member of his staff for 14 years until he retired. The final years with Berkley my staff responsibilities were broadened and I was named Director of his Iowa offices in addition to continuing my duties as farm advisor. Upon learning Berkley was retiring in 1986 I ran as the Democratic candidate for the U.S. House of Representatives, the office he previously held. My opponent was Fred Grandy from Hollywood, California. Mr. Grandy won by less than a 51 percent margin. I then worked on the staff of Senator Tom Harken for two years. I entered retirement in 1995 after five years as sales representative for Gateway Computers, working at their home office in North Sioux City, South Dakota. I feel strongly that activity in a political party is a normal ongoing responsibility of all citizens who vote. Anyone who only shows up on Election Day is no different than a person who professes to be a Christian and yet only attends church services on Christmas and Easter. While farming I served as a member of the Plymouth County Extension Service County Council, also a member of the Plymouth County Farm Bureau, Merrill-Stanton Evangelical Church, Plymouth County Cyclists, Plymouth County Democrats, United Methodist Church of Le Mars, National Association of Retired Federal Employees (NARFE), American Red Cross disaster volunteer, 4-H, and 4-H photographer leader. Sharp shooter award (US Army), 4-H and vocational agriculture ribbons at the Plymouth County Fair, named one of three outstanding Plymouth County young farmers in 1967, named outstanding agriculture promoter in 1979 by the Le Mars Chamber of Commerce, outstanding Red Cross disaster services volunteer (I even have the coffee cup to prove it), and honored by being awarded the Distinguished Service Award from Westmar University Alumni Association in 1997. Lifestyles invariably change as couples move into their retirement years. Our lives have changed a great deal. The thirty years of Ardella’s diabetes has, among other things, caused her to lose her vision and much of her endurance. I am the new cook and bottle washer (with an electric dishwasher hand dishwashing is pretty much old hat). Cooking has been a new developing skill, and I kind of enjoy it, with mostly good results. I even trade recipes with the girls. This has to be family. It’s awesome for two people to marry, form a union and produce, over the years, four wonderful and healthy children, and then watch that process repeat again and again, intrigued that each child, grandchild, and great-grandchild inherited some of their physical characteristics from both of us. Who is your biggest hero, past or present? Berkley Bedell has been my greatest hero since the day he honored me with an invitation to be part of his Congressional staff. I have watched him close-up, now consider him a good friend, and even at 95 years of age and deteriorating health he has a continuing passion to make our nation a better place, his latest project working with similarly aspiring college age youngsters, encouraging them to consider government service as an honorable career. When I was in the sixth grade during the autumn of 1944 World War II was every American’s fight. Speed limits were 35 mph, and anyone seen driving faster was deemed a bad citizen. The war effort even recruited rural students in all the one-room schools in Iowa. We were informed that kapok, the material used in flight jackets of Army Air Force pilots, was in short supply and an alternative material that would float was desperately needed. Milk weed pods were chosen as the perfect material to replace kapok. Thousands of burlap bags were distributed to rural students all across Iowa and we were asked to hunt mature milk weed pods, store them in the bags, and allow them to dry out. That fall we spent three to four hours every week walking through corn fields searching for the lifesaving pods. The filled bags were counted and schools in each township competed to be the winner. Stanton #5 received the award in our township. We were one proud school. The years of World War II were a desperate time, and even though a young child (in third grade when the Japanese bombed Pearl Harbor in December 1941), we were all expected to do our part. We were given the silhouetted designs of the German and Japanese airplanes, both fighters and bombers, and told to study them repeatedly until we had the shapes of those planes well in mind. Then we were asked to keep our eyes on the skies and to report any sightings immediately. Having the Air Force base in Sioux City (presently the 185th Air National Guard) brought thousands of US war planes to the area during the war, and we became accustomed to the sound of dull drones of squadrons overhead. Many of the larger squadrons often numbered 50 to 100 planes, and we quickly learned the models of all those fighters. I think my schoolmates would agree that the P-38 was our favorite. – Tip O’Neil, Speaker of the US House of Representatives 1977-1987. I live in Remsen with my husband Paul and our cat Sweetheart. We have two grown children, four grown grandchildren, and four great-grandchildren. I have a backyard veggie garden, which provides fresh vegetables not just in the summer, but year round, as I can tomatoes and relishes and fill my freezer with many veggies and fruits. My house is full of books, mostly non-fiction. Through reading I love to learn about new things. I’ve also dabbled in writing poetry. I am near the end of a three or four-year process of writing my first and hopefully only book, a history and family autobiography. I attended a rural schoolhouse for the first few grades before it closed. I then attended the Marcus Public School through graduation. I attended Westmar College in Le Mars for a year before I was married. Twenty years later I graduated with a BA in sociology major/psychology minor from Southwest State University in Marshall, MN, and went on to get an Associate Degree in accounting a few years later. As a perpetual student I have a sporadic work history, but I have worked in a welfare department for 18 months, in a residence for mentally ill persons for three years, and financed most of my college doing childcare in our home by day, attending college by night. I began my political life supporting George McGovern in 1970 as the head of his campaign in Lyon County, MN, and was a delegate to the state convention and briefly on the State Democratic Committee. I was also an election Judge through numerous elections in Minnesota. I was involved with local groups of activists everywhere I could find them since protesting the Vietnam war and joined two protests in Washington, D.C. , against the Iraqi wars. As a diehard progressive/ socialist peace activist I supported Dennis Kucinich for President in 2008 and Bernie Sanders in 2016. A highlight for me was my opportunity to introduce Bernie to a crowd of about 1,100 at the Sioux City Convention Center prior to the caucuses. I remember going door-to-door with County Chair Mark Sturgeon in Kingsley one election season and have been fitfully involved with the Plymouth County Democrats for a number of years, mostly just before elections. Mark and I have held signs together protesting Rep. Steve King on a couple occasions. I received a Best in Place for a Lily at the Marcus Fair. I have a couple commendations for being a cofounder of Healing our Borders and co-facilitating the Alternatives to Violence Project (AVP). Try as I might, I cannot whistle and have always been envious of those who can. For some years now I have been co-facilitating Alternatives to Violence Project (AVP) workshops in the Fort Dodge Correctional Facility and am part of the New Roads Reentry Team here locally, to assist people returning from prison to readjust to society and hopefully not return to prison. There are too many to choose from, but I especially admire the Dalai Lama and Bishop Desmond Tutu. After we moved back to Iowa about 19 years ago we spent about ten winters near Douglas, AZ, on the border with Mexico and witnessed the migrant situation firsthand. I was at the founding of Healing our Borders, a group attempting to stop the increasing deaths of migrants crossing the border and to change the nation’s immigration policy. We held weekly vigils remembering those who perished, and handed out blankets to migrants returned to Mexico by the border patrol late at night on the coldest nights, with temperatures in the teens at the higher elevations. I was also at the founding of DouglaPrieta Works, a self-sufficiency project across the border in Agua Prieta, Sonora, to provide employment to lessen the need to cross into the U.S. for work. Recently I organized a protect against Wells Fargo in Sioux City this summer due to their financing of the Dakota Access Pipeline and have supported other DAPL activities. Dealing with family members who have had long-term codependency/ addiction issues. My personal current concern is our state and national healthcare situation. My daughter has chronic health problems and moved to Iowa a year ago to be closer to us. Assisting her with the paperwork through different agencies in different towns and departments has been a constant and never-ending stress. Many people who most need the help are just not able to navigate the impossible system, and I fear should it get more complicated the entire system will implode on itself. We so desperately need single-payer health insurance, as all other wealthier nations enjoy. That was one of the reasons I supported Bernie. I have four children, twelve grand-children, and seven great-grand-children. I love to go camping. For years my husband and I camped at Correctionville and Scenic Park. Now we have a camper at Camp Boji at the lakes and try to spend as much time there as possible during the summer. I am a member of the American Legion Auxiliary and a member of the Iowa Voters for Companion Animals group. For several years I volunteered at the soup kitchen in Sioux City. I graduated from Kingsley High School and attended Westmar College for one year. I worked at Northwestern Bell for a year as a long distance operator then held a few other jobs after getting married. I worked for Senator Tom Harkin for over 20 years. I started as a volunteer with Senator Tom Harkin’s office in 1986 and then was hired on as staff after a year. As I said, I worked for the Senator for over 20 years. I was a member of the Woodbury County Democratic Central Committee for many years and served as secretary for over 10 years. I am currently a member of the Plymouth County Central Committee. Last year I was honored to receive the activist award from the DAWN’S List group. I received 10-year and 20-year awards from the US Senate for my years on Senator Harkin’s staff. Upon my retirement I received recognition from Governor Chet Culver, the City of Sioux City, the Iowa House and Iowa Senate. I lived on an acreage for 20 years and learned to vaccinate cows and sheep. Tell me what you’re most proud of: I am most proud of my children, who have always been supportive of me in the choices I have made regarding my personal life and my work with Senator Harkin. I’m also very proud of the work I did for the Senator and in being able to help constituents who were confronting difficult issues. My biggest hero is Senator Harkin. He fought for all the right causes and was very effective in his work. His constituent work was his highest priority, and I am proud to have been a part of that. Probably active for over 40 years. One hurdle was learning how a Senate office works and learning to deal with agencies to help constituents. Dealing with threatening people coming to the office was a definite fear, but I did it and learned a lot about dealing with various personalities. I have a six-year-old Bichson named Molly Bear. My interests are water color art, community service, and traveling. I’ve been doing water colors for six years and do three classes at the Sioux City Art Center every year. I am President of the Arts Center, The Friday Club, and Secretary of several other clubs and organizations. I take care of St. George’s Episcopal Church as the Senior Warden now for the 15th year. I work at Hands Around the World in Orange City from April to December and take the winter off because of the weather in Sioux County, which is actually worse than Plymouth County. I have traveled all over the world, including many of the lower 48 states, Alaska, Europe, and the Caribbean. I have an MA in history (I am an Egyptian freak) as well as a major in English and taught high school for 35 years. I have been retired from teaching for 16 years. 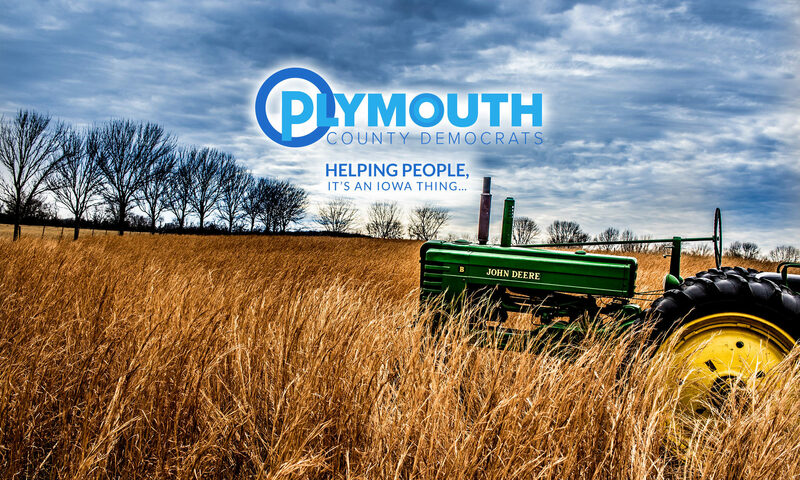 I am the Secretary of the Plymouth County Democrats and have been active in the Democratic Party since 2008 but a Democrat since before Reagan was President. I am a big Obama supporter. I believe politics is the business of every citizen. I’ve been very lucky most of my life, so I’m well named. I recently found out that I am related to Henry the VIII (not directly, but through one of his sisters, which one I don’t know, and that’s a long story. That part of the family left the U.S. when the Constitution was signed after fighting in the Revolutionary War (apparently on the wrong side). They left for Canada, going so far as to change their name, but eventually came back years later. The Lucketts have been here since 1650, arriving in Maryland and living there until the Revolutionary War was over (THEY fought on the right side). They received land certificates to go to Kentucky, so every summer eight or ten allied families would take their worldly goods and head west, eventually settling in western Kentucky, where my grandfather was born in the late 1700’s.